For the most comprehensive Lewis & Clark adventure combine our canoe trip on the Wild & Scenic Upper Missouri and walk in the last true remaining footsteps of Lewis & Clark on the Lolo Trail, where little has changed since the expedition crossed this ancient trail. Lewis & Clark Trail Adventures is the only outfitter licensed and permitted on BOTH the Missouri River AND Lolo Trail. Experience why Lewis & Clark described the Lolo Trail as the most challenging yet majestic portion of their journey. We’ll visit sites along the trail where they endured great hardship like Wendover Ridge and Snowbank Camp or the “inexpressible joy” on Spirit Revival Ridge. The Lolo Trail is a high mountainous ridgeline trail that allows you to see where the expedition came from and brings to light the decisions they faced. You will have the opportunity to explore Lewis Clark camps rarely visited in the last 200 years like 13-Mile, Sinque Hole, Lonesome Cove and many more. Hiking the Lolo Trail – The most challenging section of trip is Wendover Ridge. The trail begins with a 2 miles of switchbacks then follows the ridgeline for 6 miles. It climbs approximately 3000 vertical feet from the Lochsa River to Snowbank Camp. This trail climbs steadily and really gives you a feel for the difficulties the expedition faced. This trip does not require any technical skills but we recommend you are in good physical condition, have previous hiking experience climbing in elevation and the desire and determination to reach the top! If others in your group want to see the Lolo Trail but not climb Wendover Ridge an alternative itinerary can be planned with historical interpretations and both groups will meet at camp to share their stories of the day. Our goal as an outfitter on this trip is to help you get off the beaten path to see remote areas of the L&C Trail not accessible by car. Below is information to help you plan the “self-guided” discovery of the L&C trail along highways and towns. Our Missouri trips meet in Fort Benton, MT, 35 NE of Great Falls, MT on Hwy 87. 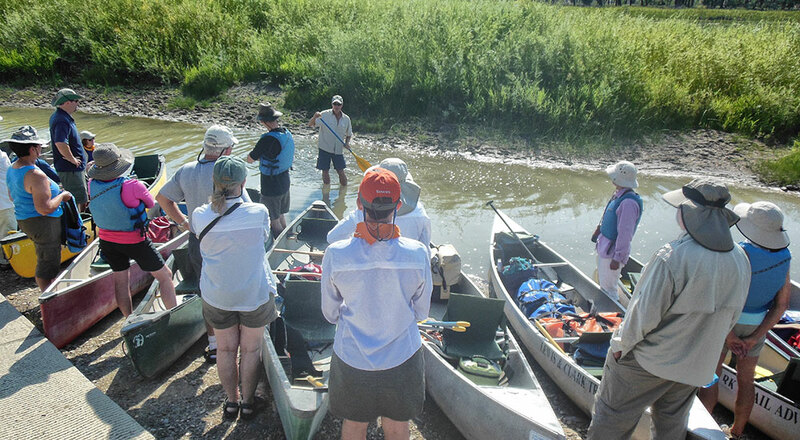 We begin paddling from Coal Banks Landing, 45 miles downriver from Fort Benton and provide transportation based out of Fort Benton. The Lolo Trail trips meet and return to Lochsa Lodge, 50 miles west of Missoula, MT on Hwy 12 and we provide transportation based out of Lochsa Lodge. We suggest having map of MT & ID and the L&C route handy while planning your travel itinerary: There are two different routes between the Missouri River and Lolo Trail, either Hwy 12/I-15 through Helena, MT and Hwy 200 through Lincoln, MT. One could fly in/out if Missoula and rent a car based from Missoula that way at the end of your trip on the Lolo, just a short drive to Missoula for lodging and flight out. If more pressed for time, one could fly into Great Falls and out of Missoula with a one-way car rental. We are happy to help you plan the best itinerary for you based on what areas of the Lewis & Clark Trail you would like to see. Feel free to call us for suggestions. We take pride in their camp menu. Meals should be something you look forward to and expect more than your average camp cuisine. Start your day with a good cup of coffee and a hearty breakfast like pancakes & sausage with fresh fruit & juice, lunch is welcome stop with sandwiches made with quality deli meats & cheese, lots of fresh veggies & snacks, dinner might be grilled Steaks or Wild Salmon, dutch oven potatoes, colorful salad, bread from local bakeries. Beer and wine, in moderation, is provided with appetizers & dinner. Water, sparkling water / sodas, Gaterade is also provided. We are happy to accommodate various dietary needs so let us know your requests. Call or email for additional availability, group & family discounts and putting together a custom Lewis & Clark active adventure. Remember, Lolo Trail should be planned mid-July and/or after to allow for snow pack to clear. Give us a call to discuss the best itinerary for your adventure! Missouri River Aug 7-9 and Lolo Trail Aug 11-13 – Aug 10 is a free travel day. 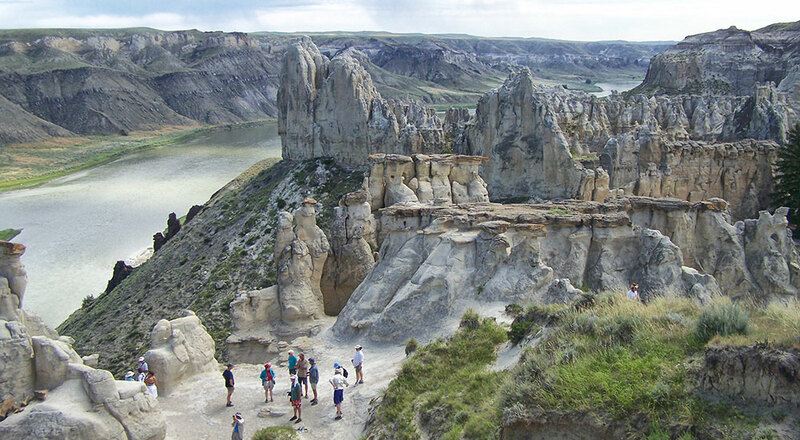 The Missouri River Canoe Trip and the Lolo Trail Hiking Trip are available as separate activities and therefore must be booked as separately. During checkout, you can add each trip to your cart and pay for them together.